One of the best known of the deciduous types is Magnolia stellata Waterlilly. Wonderful white fragrant flowers on bare stems in spring cover this small tree (see picture right). The flowers will open a pale pink, however they quickly fade to good clean white. Also known as the ‘star magnolia’ because of the flower shape it is spring flowering and is covered in masses of flowers for weeks. Good green foliage follows. 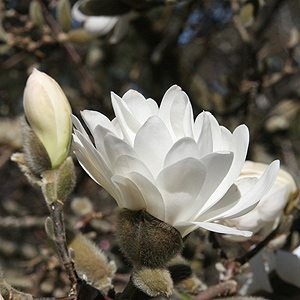 Widely used as a feature tree either in a lawn or in the garden border, Magnolia stellata can also be grown in a container. With a shallow and non-invasive root system they present few problems when planted near pathways or buildings. Reaching around 3m (9ft) Magnolia stellata Waterlily prefers a humus rich moist soil and a little shade from the hot afternoon sun. Best planted where it does not receive to much competition from under planting, including lawns. We suggest mulching to the drip line. Little pruning or additional care is required once established.